75th and Sedgwick: Pass the wasabi, please! I hear you on trying to find the motivation to exercise. I've been looking everywhere for it. Jeff ran the Army 10 Miler on Sunday and Jeff's Dad ran a half marathon this past weekend. Inspiring for sure, hopefully inspiring enough to at least get me to pop the yoga dvd in! I definitely recommend yoga, I know you've always been a runner, but I think it's a great supplement and good "active recovery", whatever that means. I suggest taking a beginners introduction class if you can find one. Jeff and I took a four week intro course and it was really helpful to break down all the movements and learn how to do them one at a time. Sometimes I get stressed in yoga classes just trying to keep up, which I realize is the exact opposite of how you're supposed to feel. Good luck and keep me posted! Now to REALLY inspiring news: I came across this blog the other day on pinterest. I noticed a lot of people were pinning these terrific color combos so I followed the trail to design seeds. 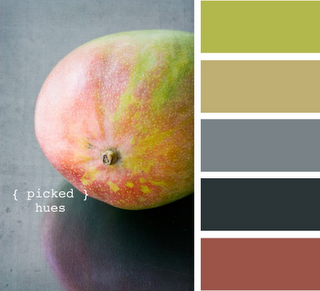 Jessica puts together a daily palette of color based on a random photo. I never would have thought "the color inspiration for this room is..... SUSHI! ", but now I'm rethinking everything! 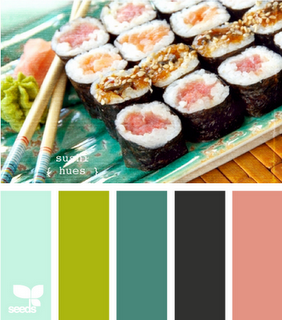 Regardless of how you feel about sushi, this is a great resource for color inspiration and I'm definitely bookmarking it!